I WAS sitting at the summit of a mountain recently when another walker arrived, touched the cairn then picked up a rock to place on the pile. I hadn't seen anyone do this for years. When I started walking the hills, it was a common sight, almost a ritual, when reaching a summit. 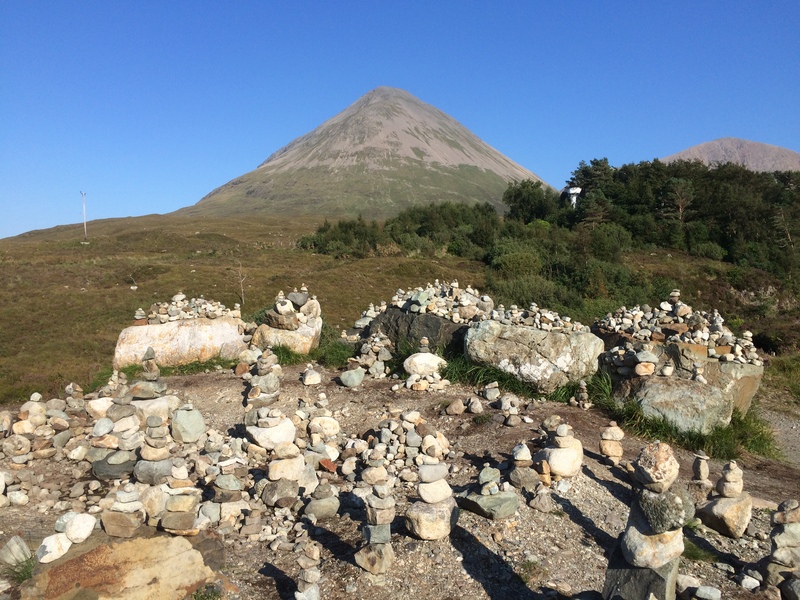 The trouble is that with the continuing increase in popularity of peak bagging, some of the summit cairns have become overloaded, transforming an often simple marker into an untidy pile of rubble. Think about it. If everyone who had climbed Ben Nevis over the last 30 years had added a rock, the cairn would be getting near Munro height itself. I also wonder how many folk who do this realise that the tradition of adding a stone to a cairn dates from long before hillwalking became a leisure activity. The ancient Scots blessing, “Cuiridh mi clach air do charn”, means “I will put a stone on your cairn”. It was said that before Highland clans went into battle, each man would place a stone in a pile. Those who survived returned and removed a stone, the ones that remained were built into a cairn to honour the fallen. Correct me if I'm wrong, but I don't remember any major battles in recent times involving warriors in lurid waterproofs and lycra. I have witnessed a few late-night skirmishes in certain climbers' hostelries, but that's another story altogether. The subject of cairns has been thrust into the spotlight again recently, in part because of the blight of so-called 'rock sculptures' – ie. 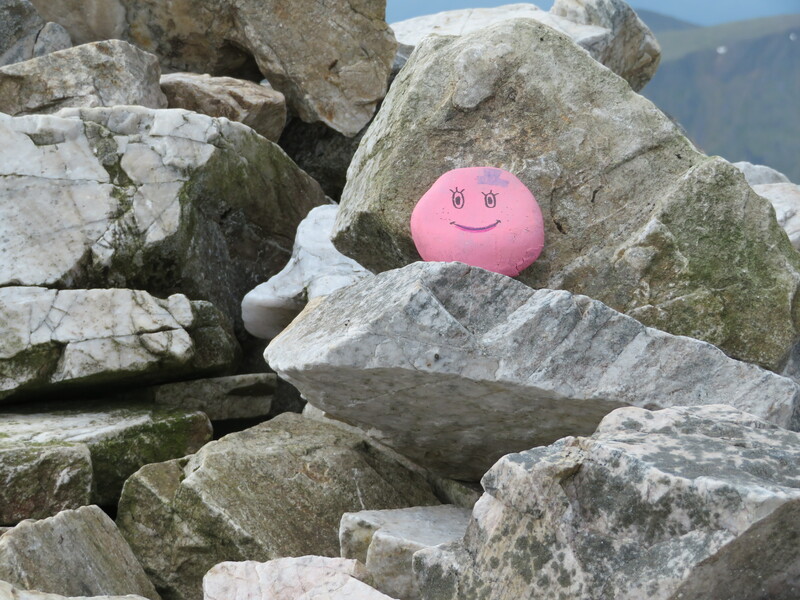 random stacked stones – in certain tourist hot spots, and the growing trend for leaving painted rocks, some with messages, on mountain summits. Even in the wildest and most beautiful landscapes, it seems the human race just can't resist leaving behind some sort of calling card to draw attention to our fleeting existence. 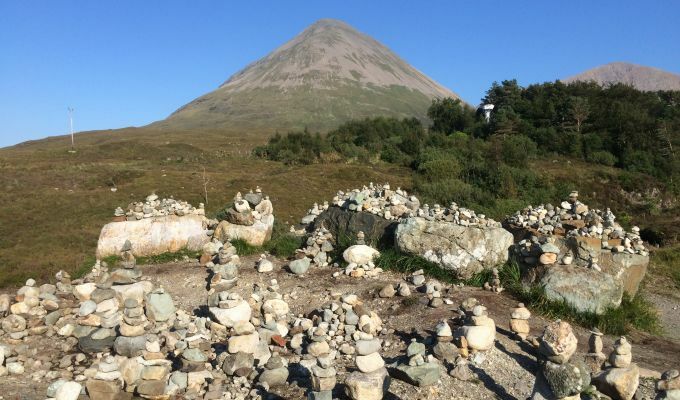 I remember a week on Skye where mountain rescue team leader Gerry Ackroyd spent a lot of the time kicking over superfluous cairns which had seemed to have appeared overnight. He regarded them as an unwelcome distraction that could easily give a false sense of security and lead the unwary astray in the hostile landscape of the Black Cuillin. There's no doubt some summit cairns are a mess, and the proliferation of impromptu route markers on some mountains can get out of hand. But it can be an emotive subject. Every cairn is different; no one size fits all. You can have a big, beautifully built beehive which looks perfect in the setting on one mountain, while a smaller, untidy stack of boulders on another just looks out of place. Some mark burial sites or are memorials which have been there for centuries, and they should be treated with respect. Most signal you have reached the highest point on the mountain, while ones lower down can be a welcome reassurance on tricky terrain. Some were simply a form of bragging rights, especially for landowners who believed that size mattered. Ben Lawers was a prime example. At one stage this cairn was made up to some 20 feet high in the hope the mountain would be recognised as one of our 4,000-ft peaks. Needless to say, no one was buying that and it was later dismantled. Alan Dawson, mountain surveyor and author of The Relative Hills of Britain, has recently launched a clean-up operation on what he believes are some of the worst culprits. The result is that cairns on the Munros Sgor na h-Ulaidh, Ben Challum, Meall Garbh in Glen Lyon and the Corbett Beinn Odhar have been drastically slimmed down. His work is not universally welcomed. Some walkers have complained about this type of arbitrary alteration by one individual. Others argue that his minimalist structures may not survive long in our harsher weather conditions. But the argument that cairns should be left alone in their current form isn't on solid ground either. A lot of these piles are the result of gradual accumulation from peak-baggers so they have already been altered from their inception. At what point in time do you draw a line? In some cases, cairns come and go. Hills that have historically tended to be without a cairn suddenly 'inherit' one, and then someone else comes along who feels strongly about a change in the natural landscape and knocks it down again. One recent example was on Aodainn Chleirich where a few stones which had laid on a crag to mark the true summit on this Graham among a series of possible high points were then unceremoniously dumped. So one individual decided this hill needed a summit marker, and another felt the opposite. It feels like it could be a never-ending story. Meanwhile, the rest of us will just need to carry bigger rucksacks to carry away the painted stones along with the rest of the detritus left by the selfish minority that don't seem to understand the 'Leave no Trace' message.